I am mathematics communicator at the Mathematisches Forschungsinstitut Oberwolfach. I studied mathematics and computer science and did my PhD in mathematics in machine learning at the University of Innsbruck and the University of Buenos Aires. Since 2007, I am coordinating the project IMAGINARY. I also curated the MiMa, museum for minerals and mathematics in Oberwolfach, I am member of the Raising Public Awareness Commitee of the European Mathematical Society. And (at least equally important), I like travelling, culture, adventure, human beings. On Monday we worked hard to bring our Maths exhibition exhibition to the Next Einstein Forum venue, and to setup everything. Find below a few pictures! It was hard, time was short, logistics was tricky, but: the venue is amazing! We got the prime spot of the venue, just right at the main entrance – and the whole NEF organisation is very professional! Packing all items (inside and on top of the car). 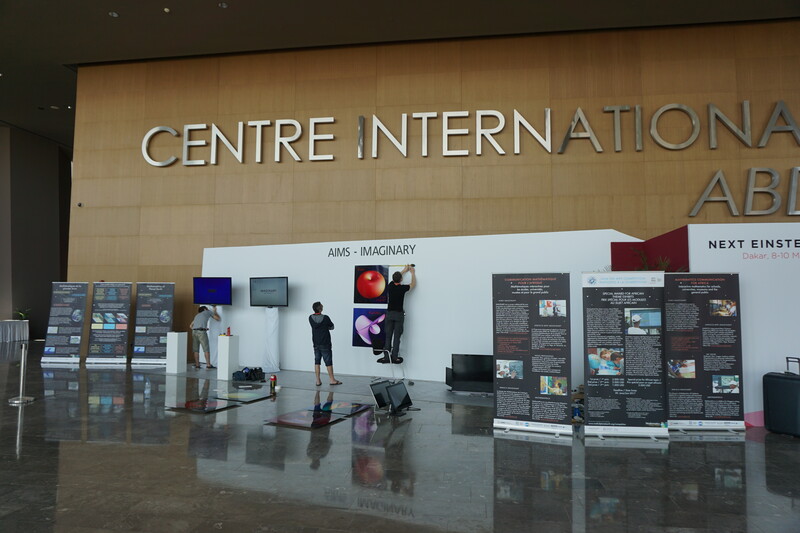 Mounting the exhibition (roll-ups, images on the wall, screens, touch-screens). A big part of the exhibition is about “Mathematics of Planet Earth”, we will also launch a new competition about open exhibits – so everybody can contribute with own exhibits. The local NEF tech team help us to fix the images on the wall. I am sitting at the AIMS-Senegal institute in Mbour (about 1.5 hours drive South of Dakar) and together with my team member Sebastian and the AIMS-Senegal staff and students, we are preparing an interactive mathematics exhibition (as part of the IMAGINARY – open mathematics project).. It will be shown as of March 8 at the Next Einstein Forum (NEF), to be held at a huge conference venue just outside Dakar. There will be many ministers, scientists, politicians, even presidents from (apparently all fifty-four) African countries – and also many international guests – joining the NEF, with the goal to discuss about scientific innovations, collaborations and solutions in Africa! We have to plan to blog live from the NEF, with insights and views from participants. And of course, we will let you know about our exhibition, about a new competition, we will launch and everything happening around! this is a picture story, so be prepared to see many pictures! And it is an adventure too, since we (I will explain later who is “we”) tried something quite new: an interactive highly technical mathematical exhibition in Senegal, including a road show with high school students and Master maths students, talks, conferences, workshops and discussions, and games! And: all in three days! Check out the latest issue of the AIMS newsletter. It features images and a report on the AIMS-IMAGINARY workshop on “Mathematics Communication in Africa” and the exhibition, shown at AIMS-South Africa in Muizenberg. 1. CANP4, the fourth event in the Capacity and Network Project organized by the International Commission of Mathematical Instruction (ICMI) and supported by the International Council of Science (ICSU) held its first meeting in East Africa in Dar es Salaam, Tanzania, on September 1-12 204, with more than 80 participants from Tanzania, Kenya, Uganda and Rwanda, This event led to the creation of a new ‘East Africa Mathematics Education and Research Network’. The founding President is Dr Alphonse Uworwabayeho (Rwanda) and the founding Secretary is Dr. Angelina Bijura (Tanzania). 2. Call for Candidates for Ibni Prize 2014. I am a mathematician, and I would like to stand on your roof.’ That is how Ron Eglash greeted many African families he met while researching the fractal patterns he’d noticed in villages across the continent. Watch this TED Video by Ron Eglash, an ethno-mathematician, who studies the way math and cultures intersect. He has shown that many aspects of African design — in architecture, art, even hair braiding — are based on perfect fractal patterns. A workshop-exhibition to understand and plan maths communication and maths outreach activities in Africa, organized by the African Institute for Mathematical Sciences – Next Einstein Initiative (AIMS–NEI), IMAGINARY and the Mathematisches Forschungsinstitut Oberwolfach. The workshop and exhibition will be hosted at AIMS-South Africa, in Muizenberg, Cape town.